Roger:"The registration and the chain drive indicates a post-war event. From the registration and the riding number my best estimate is the 1920 Isle of Man TT where Dan was team manager." Martin:"The interesting thing about this picture of O'Donovan is that it has a Leicester number. 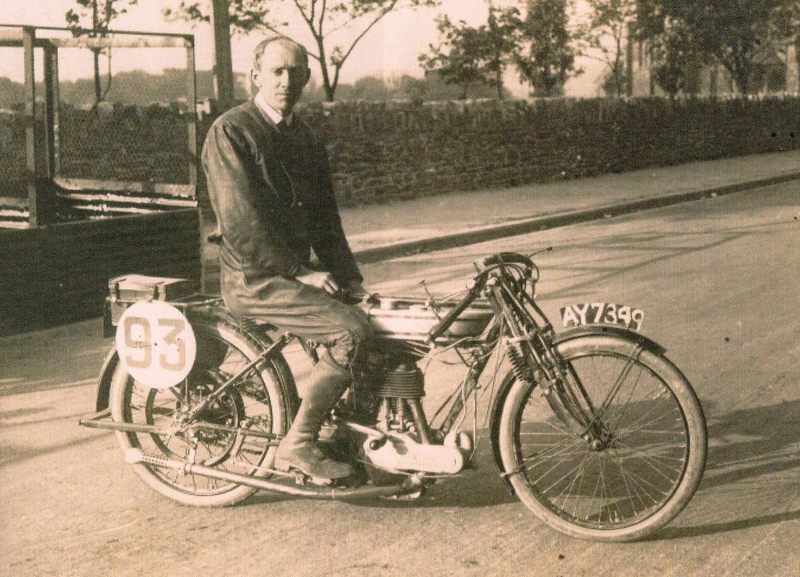 Look at page 62 of the Woollett book (above) and you will see the Norton camp at the 1920 TT. The bike at the front which isn't described in Woollett's caption belonged to Leicester motorcycle dealer Harold Petty and below is an extract of the Leicester county records showing the details of this bike which was finally scrapped in 1934, its last owner having had it attached to a sidecar, a sad end for an ex TT bike! . Petty retired in the 1920 TT but Nortons did better than ever that year, coming 2, 4, 7, 8. 10, 11, 13 and 14, and four other Norton riders apart from Petty retired. 11th was Norman Black on the last Norton belt drive TT entry, a pretty good effort for his first ever TT ride, the start of a longish TT career through the twenties. The question I would want to ask about this picture is was this a Petty-owned (and hence Leicester registered) bike, and if so, why was O'Donovan riding it? I will get the entry from the Leicester public record office so we can see whose bike it was!! Possibly it was a bike ridden in the 1920 by a rider who retired and maybe D'Donovan rode it before or after the race, as he wasn't a rider himself by that time, his only TT rides being 1913 and 1914." As with all things to do with Nortons, the more you find out, the more you realise that nothing is as straightforward as it seems. "At the top end of London Rd was Leicester's own Velocette dealer- Messr's Petty's. Here was a place where time stood still. The cut and thrust of business in the 1970's was not really for them. Customers were addressed as "sir" and the whole manner was more akin to a gents outfitters than a busy motor-cycle shop. Many of us called in on a Saturday afternoon, not to part with money, but to listen to "young" Harold recall the halcyon days of motor cycling. If anyone wished to buy something, Saturday Geoff was summoned, and the part required described in detail. In a scene reminiscent of Grace Brothers "are you being served" he would enquire if Hilda (who had an encyclopedic knowledge of all things Velocette) was "free". She would then fetch the part, place it in a bag for you, issue a till receipt and amend the stock records. Meanwhile outside Petty's the entertainment continued, with us teenagers gathering around to watch various motor cyclists following the starting procedure, or ritual, to bring a hot engined Velo into life. It seemed to us that the number of kicks to start a Velo was directly proportional to the number of people watching!! Sometime in the 70's Petty's closed, and the names, faces, and genteel procedures passed into motor-cycling folk-lore."